The Isle of Wight is an historic and almost mythical place for sailors. From Cowes week which started in 1826 to what is now known as the America’s Cup and its origin in 1851, the sailing tradition there is long and storied. We were already planning a trip to Europe this summer, but when asked if I was interested in helping a friend by driving his RIB as a chase boat in this year’s Round The Island (RTI) race, my wife Marjorie and I jumped at the chance. The RTI has been a British sporting tradition since 1931. It started with a mere 25 yachts and has grown to a massive event peaking in 2016 with more than 1,800 entries. RTI is one of the largest yacht races in the world and the fourth largest sporting event, by participation, in the United Kingdom. The 50 nautical mile course is straight forward; start at Cowes, head west around the Needles, turn the corner, keep the island to port and finish back in Cowes. Although seemingly simple, the course has a variety of tactical questions, including strong tides, shallow areas and other obstacles to avoid. Rules governing both the course and boats allowed to compete have varied over the years with one of the most significant changes coming in 1961 when multihulls were first allowed to enter. Our team is lead by accomplished British catamaran sailor, William Sunnucks who, with his crew Mark Self (easily one of the nicest guys in the sport! ), will be sailing his modified Marstrom 20, the Vampire Project. This will be William’s sixth trip around the Isle of Wight and, like all his others, will be unofficial since race organizers do not allow small catamarans of this size to enter. 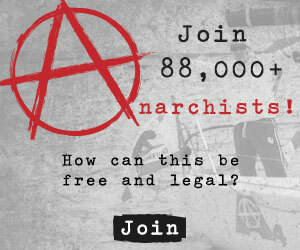 We’re told that this limitation is in the name of safety, however, with our collective depth of experience in long distance catamaran races (Worrell 1000, Tybee 500, F-18 raids, etc. ), we aren’t too concerned. Team confidence is also buoyed by William’s incorporation of a dedicated chase boat which I will be operating as well as the fact that my wife, an active duty US Army officer and critical care nurse will be joining us on the trip. From the outside, my task for the day sounds simple: “keep up with a 20 sailboat by driving a 6.1 m RIB with 140 hp outboard engine”; that is, until its factored in what I’ll be chasing. The Vampire started life as a Marstom 20, a high powered all carbon/nomex catamaran designed to be the fastest boat of its size and eclipse the mighty Tornado. William employed the help of designer Kevin Elway and boat builder Graham Eeles to integrate canting T-foils with a Moth style control system, but with the beam– and therefore righting — of a catamaran. The Vampire first foiled in July of 2014 and has been undergoing continuous development and refinement since then; you might even notice the similarity between it and the current generation of America’s Cup yachts. Much to my delight, after 15-20 minutes of driving the chase boat, William slowed down and motioned to me that it was my turn. I quickly donned my trapeze harness and life vest, eased over to the windward side of the Vampire and traded places with Mark. After a quick tutorial of the control lines and directions that I would be receiving, William gave the tiller a pull and off we went! “As soon as the leeward hull starts to fly, sheet in and we’ll start to foil” were my instructions, and as I pulled, the boat quickly accelerated and immediately gained altitude. After mere seconds we were seeing upwind speeds in the mid-high teens and I was do my best to adapt and respond to William’s commands requesting more and less righting moment. We made a slow tack, swapped foils and were off again; after a couple more minutes of upwind work, I was told that we would be shifting to downwind mode where we would see some real speed. Upon completing a couple of quick foil angle adjustments “on the fly”, we headed down and almost instantly doubled our current velocity. To say that the speed was breathtaking would be a massive understatement and although I could have stayed out there for hours, daylight was fading and we had to be up early for the real race the following day. Although it was a short “test” sail, we easily eclipsed my previous personal speed record from the 2002 Worrell 1000 by a couple of knots and reset the bar at 29.8 kts… oh so close to 30! 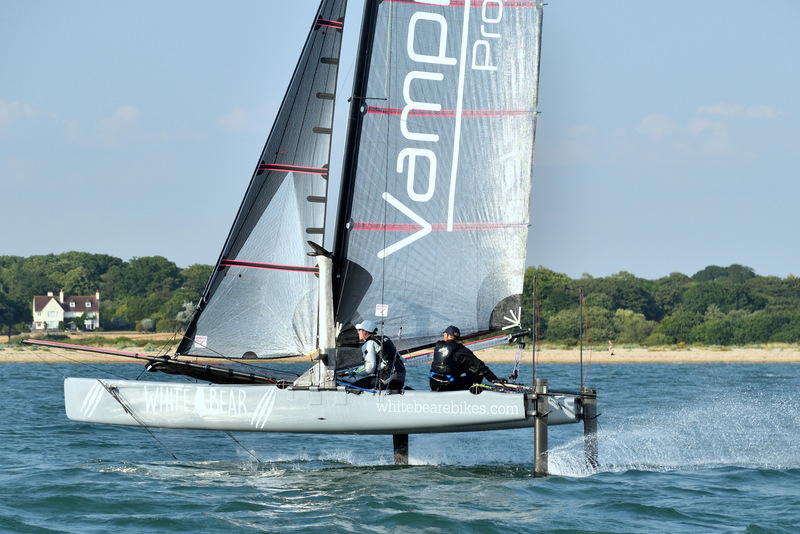 I’ve sailed a couple of other foiling catamaran platforms, but nothing comes close to the raw power and speed of the Vampire. This year’s RTI race was the Vampire’s first trip around Wight and although it regularly sees the speeds we enjoyed the day before, the forecast doesn’t look promising, so we prepared for a long day on the water. Upon leaving Hasler shortly after 0600, we fixed a tow line and headed toward the race course. Since we weren’t an official entry, William had made the decision to respect the starting line and at 0640 started just to windward on the north end of the line. It was a beautiful morning for sitting outside with a cup of coffee; not so much for a sailboat race. The breeze was a light 3-4 knots out of the West with a swift outgoing tide. Regardless of the lack of wind, the sight of just over 1,200 boats getting ready to start at their assigned times in the Solent was breathtaking.